Are women free to take decisions about their bodies, appearance and the way they dress? Are their tastes ‘truly their own’? To what extent is the way we are and think about other women determined by social conditioning? 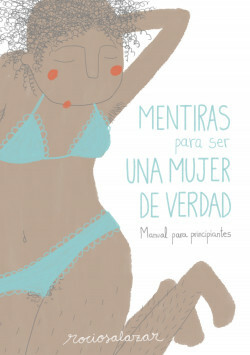 In this manual for beginners, Rocío Salazar uncovers some of the many lies that women tell themselves: that we’re thin, that we have beautiful, pony-mane hair, that we smell of flowers, that we’re all blonde, that we don’t age or menstruate and never get grey hairs. Through her charming characters and ironic illustrations the artist sends a powerful, affirmative message: there’s no reason we should identify with just one model of woman based on gender stereotypes and imposed conventions. There are lots of very simple ways to subvert these norms, rediscover ourselves and truly enjoy who we are once more.